Every four to five years a diverse group of people get together to talk about extreme winds, how they flow over land and through forests, their effects on tree growth, the damage they cause, and how the risks and effects of windthrow might be managed. This year the International Union of Forest Research Organisation’s Wind and Trees international Conference was held from 3rd – 8th August in São Paulo, Brazil. John Moore, a Research Leader in Forest Systems, attended the conference where he presented a keynote address on the impacts of wind in intensively managed plantations. He also presented a paper on the impacts of thinning on the risk of damage. For the in-conference fieldtrip, delegates were hosted by Fibria. Fibria is a Brazilian company and is the largest producer of eucalypt pulp worldwide, with an annual production capacity of 5.3 million tons. It has a total forest area of 968,000 ha of which 625,000 ha are stocked – the balance is in reserves. It also has forest nurseries and an extensive tree improvement programme. According to John, the most amazing thing about Fibria is its astounding productivity. “Fibria has quadrupled its productivity in four decades by intensively managing every aspect of forest growing from tree breeding, establishment and silviculture. A typical rotation is seven years and the mean annual volume increment is around 60 m3 ha-1 yr-1. “They grow Eucalyptus grandis and an E. urophylla x grandis hybrid and select for growth rate and pulp yield. We were told that they plant around 7000 ha per month, 12 months of the year. 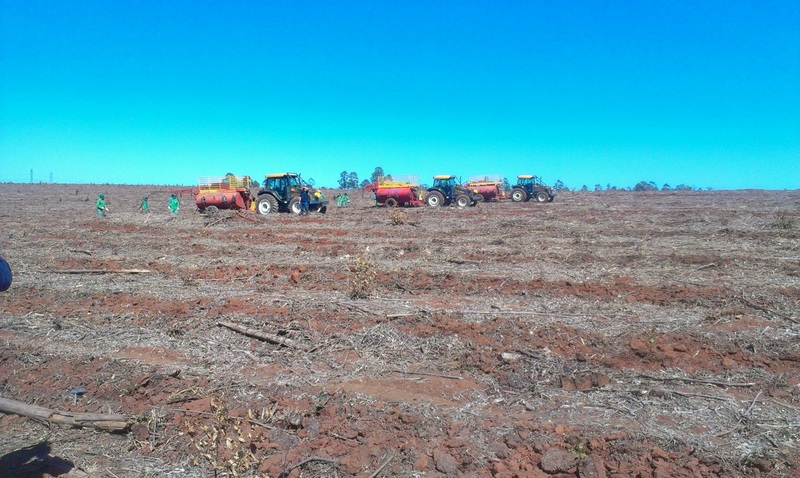 Each year they plant around 84,000 ha, which is approximately double the total re-planting done in New Zealand. “The labour inputs needed to achieve this level of productivity are considerable. Fibria employs a large number of people, who appeared to be well looked after and were issued with a uniform and safety equipment. Standard safety gear includes snake chaps! John Moore modelling snake chaps. 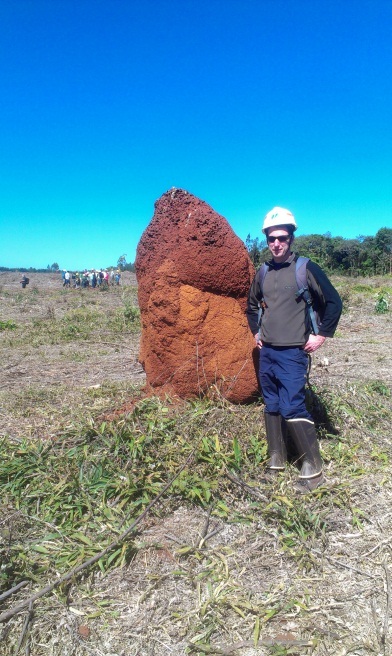 Even the anthills were large in Brazil. John also took the opportunity to visit CMPC (Compañía Manufactura de Papeles y Cartones) while he was in South America. CMPC is the second largest pulp and paper company in Chile with 600,000 ha of planted forest and a further 300,000 ha of reserves. An integrated company, it owns forests, sawmills and pulp and paper plants. John was hosted by the forest growing and sawmilling division of the company – Forestal Mininco – in the area around Los Angeles. “The forests are primarily radiata pine, although there was also a significant area of Eucalyptus nitens. I visited a sawmill in Mulchen where they were processing both radiata pine and Eucalyptus nitens,” says John. “The mill had done extensive trials to determine how to saw this species and had also experimented with thermal modification. Birdseye (needle fleck) was the main defect in the appearance grade radiata pine timber that they were producing. 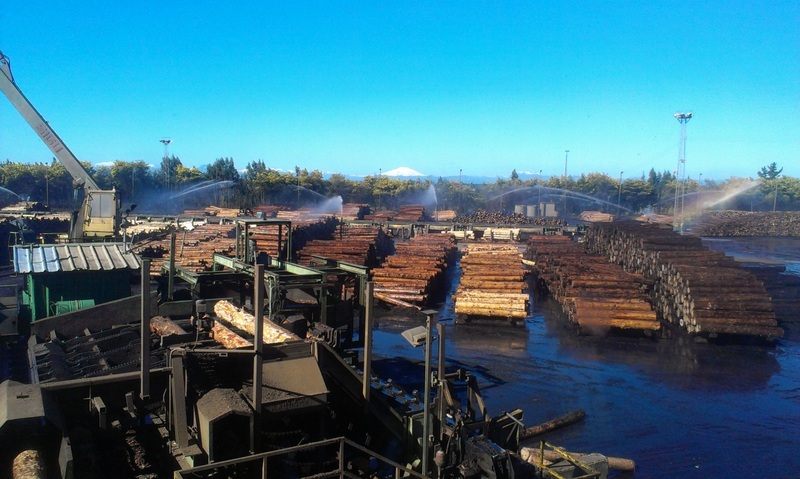 Log yard at the sawmill in Mulchen, CMPC, Chile.